I could stare all day at the silhouette of my cat in the window, his body dark and hard to see against the light, but the sun showing up a bright halo of cream detail around each tuft of fur on his head, back and tail. He unmoving and meditative as cats appear, basking in the early morning light coming through into the lounge room. All in all, he’s not really a cat who like sun, not like others I’ve known who were veritable sun worshippers. Usually he likes dark nooks and diving under my doona the minute the daily temperature drops below 15 degrees Celsius. He’s 17 now and getting skinny and the vet says he probably has kidney disease. It’s hard to think of life without his constant (often demanding) presence, but for the moment he’s here sunning himself, and posing against the light, enjoying the sun, and the worship of his human, as every good cat should. A few years ago I went on a small-group tour from Adelaide to Perth, across the Nullarbor plain. Some days in the bus it was a sweltering 46 degrees Celsius. In Western Australia we visited the stunning Cape Le Grand National Park, east of the town of Esperance, and camped there for a few days in our canvas swags. 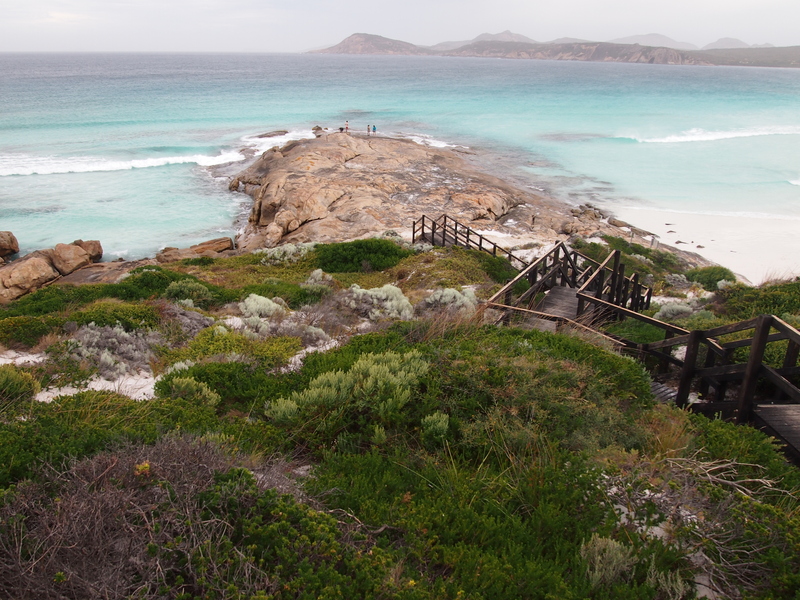 The clear azure waters of Lucky Bay were tantalising, with their firm white high-silica based glassy sand and the green and granite headlands to look out at. Kangaroos even frequent Lucky Bay, the only time I’ve ever seen them on a beach. The sky was blue and the sun was shining and swimming was the thing to do. That night trying to sleep in my swag I realised I’d had too much of a good thing, my body was so uncomfortable there was no good way to lie, and I started shivering. I had to get up in the middle of the night to have a shower to somehow try to address my foolishly acquired sunstroke. The time in the water had been so refreshing, swimming and splashing with others from the group, but I’d forgotten how much the sun could reflect off the crystal clear water and burn like nobody’s business. I’m glad that time has taken away the discomfort of that terrible night of painful attempts to sleep, and left me with the impression of a sun-drenched paradise. A few years before that I had the opportunity to visit Vietnam on a very small-group tour (turned out to be only three of us and our guide). It’s sounds like a joke when I say it was an Englishman, an Irishman, an Australian, and our Chinese guide. One day while staying in the Ha Long Bay area, we opted for what I think was described as a ‘bush walk’. Well it was up hill and down dale through a forest, over giant tree routes and we in our sensible hiking gear were led by a local in his thongs (flip flops). He was indefatigable and kept hurrying us along. We didn’t quite see the urgency as we wanted to enjoy the walk and take advantage of the photographic opportunities. Anyway, at long last we arrived at a rural village and were treated to lunch outside a local house. After lunch we walked through the village at a cracking place, and I assumed we were making for the road and a vehicle of some sort. However, we ended up on another long (but much flatter) walk, passing roaming goats as we went. Just as I thought we must reach a road, we reached a dead-end jetty instead. Now the sun was setting and the light was getting low and finally I saw the urgency of it all. This next stage of our journey involved a trip on a very small, low boat that didn’t have any lights. We crossed the water and arrived at the shore of the island thankful, just as we lost all light (by the way this was not the end of the journey, they then announced to us that we would be taken by motorbike taxi back to our accommodation – and I had elected not to pay more for motorbike insurance on my travel policy, as I was adamant that I wouldn’t be going anywhere near a motorbike (let alone riding on the back of one behind a local, in the dark, up and down steep island streets). My expectations and the need for light reminded me to be thankful of what I have at home – ready access to electricity. 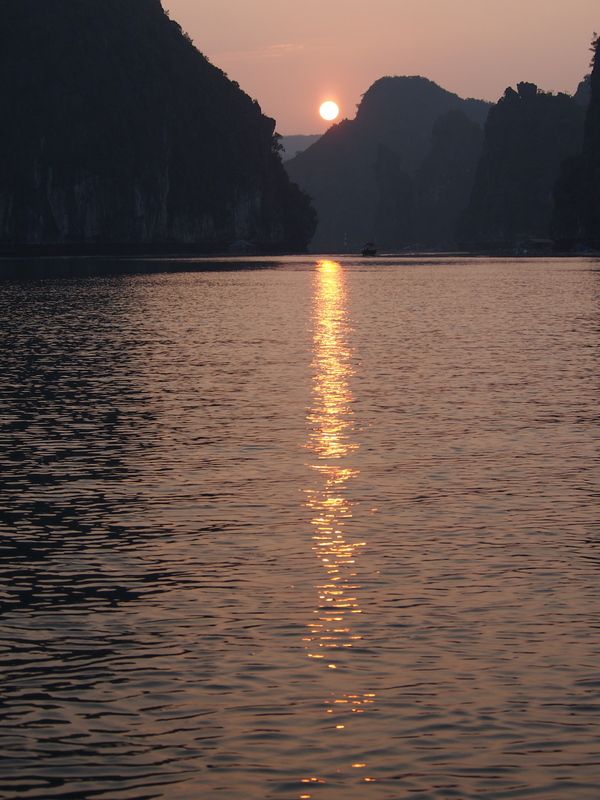 My trip to Vietnam also left me contemplating the harm that is done to countries that now manufacture a lot of our western goods as the skies in that country were gray and hazy the entire time I was there – you could never see blue, or clearly see the sun.